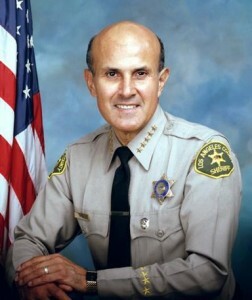 LOS ANGELES – A federal judge scheduled jury selection to begin Feb. 22 in the re-trial of former Los Angeles County Sheriff Lee Baca, who is facing corruption charges alleging he conspired to obstruct an FBI probe into alleged abuse of inmates in county jail system. U.S. District Judge Percy Anderson said earlier this week that jury selection would begin either Feb. 21 or 22. He said about 245 potential panelists would be summoned to the new downtown federal courthouse. Anderson also said jurors would remain anonymous due to the media attention the trial is expected to draw and to lessen the chance that they are contacted during the proceedings. Baca, 74, was tried in December on charges of obstruction of justice and conspiracy to obstruct justice, but jurors deadlocked 11-1 in favor of acquitting the former sheriff. Anderson then declared a mistrial. At his retrial — expected to take about two weeks — the former sheriff will also face a third felony count of lying to federal officials. The charges partly stem from a 2011 incident in which two sheriff’s investigators confronted an FBI agent involved in the jail probe in the driveway leading into her apartment, and falsely told her they were in the process of obtaining a warrant for her arrest. The charges against Baca focus on a period of time when sheriff’s deputies based at the Men’s Central Jail stumbled upon a secret FBI probe of alleged civil rights abuses and unjustified beatings of inmates within jail walls. Prosecutors contend Baca so resented the federal government’s jails probe that he attempted to force the FBI to back down by illegally having deputies confront the agent at her apartment. The prosecution also alleges that Baca ignored years of complaints about excessive force used illegally against jail inmates in county facilities managed by the Sheriff’s Department. The third count — making false statements — contends that Baca lied to the FBI in April 2013 about his knowledge of department efforts to subvert a federal probe into corruption and inmate abuse in the jail system.